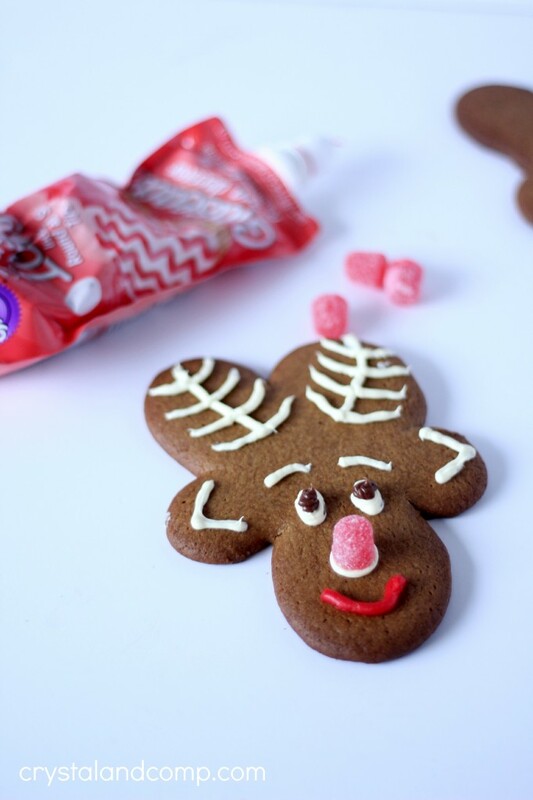 Did you know that you can make reindeer cookies using an upside down gingerbread man cookie cutter? These are so fun to make and the kids will enjoy helping. I know my boys did! Roll out your cookie dough on a slightly floured surface. 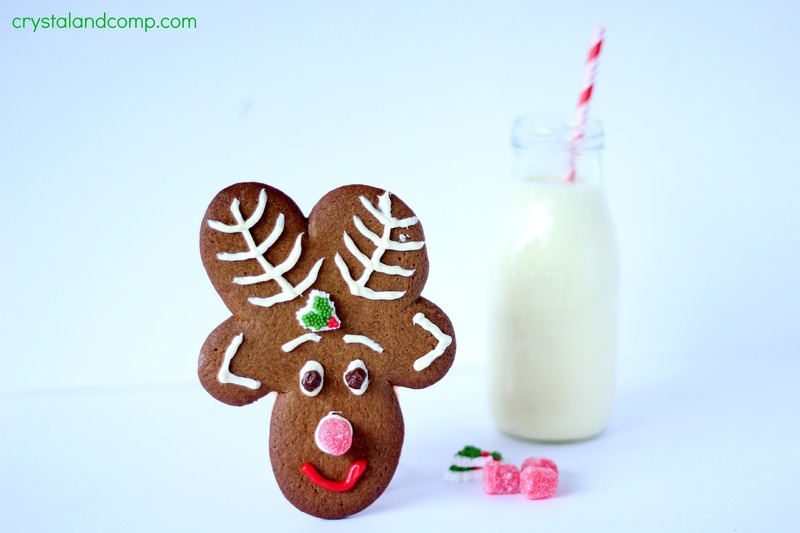 Use the cookie cutter to make the gingerbread man/reindeer shape. Transfer the cookie dough shapes to a cookie sheet and bake according to the package directions. Once done, let them cool 100%. 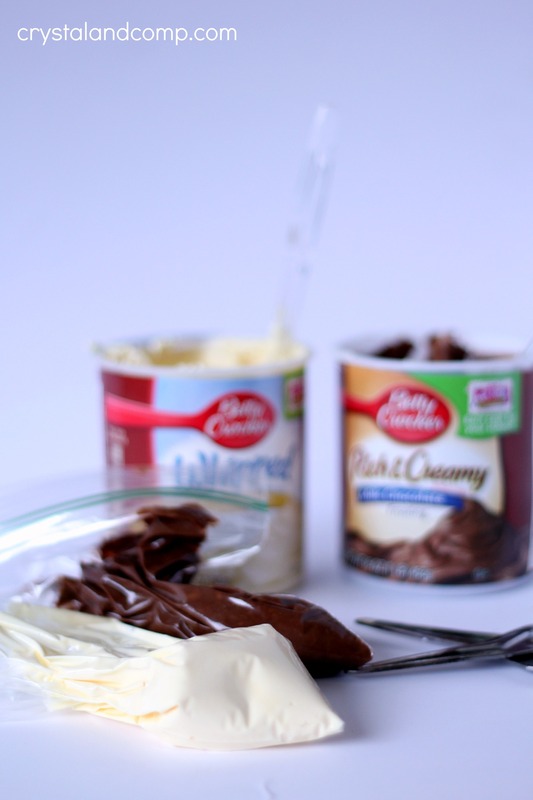 Put a couple of spoonfuls of each icing in it’s own sandwich bag. Use a pair of scissors to put a small piece of one of the bottom corners of the bag off so you can now use the bag to pipe the icing. Turn the gingerbread cookie upside down. Now you have a reindeer. Draw the antlers on as the picture below shows. Add white icing for the eyes. Then put a large dot of chocolate over that to make a more real looking eye. Use the white frosting to also serve as glue for the gum drop nose. Use the red icing to make a smile. Finally, use the white icing on the back of one piece of holly candy and stick it to the reindeer head, below the antlers but above the eyebrows. And now you have a reindeer cookie. Santa would love to get one of these when he visits your house this year. A glass of egg nog goes perfectly with this! Honestly adorable!!!! I love how you used already made gingerbread dough, so much less work. Beautiful little cookies, yum yum! 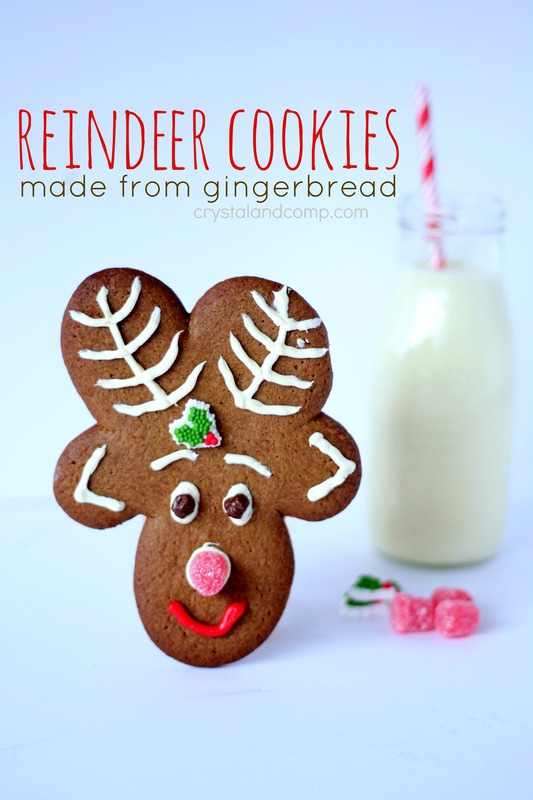 I absolutely love these adorable reindeer cookies! Stopping over from Crafts a la Mode and of course, pinned! Thanks for sharing them and have a happy weekend! Cindy Eikenberg recently posted..Best of the Weekend! OMG these cookies are so darn cute. My kids will LOVE making them! I’m featuring you this week, over at Simple Supper Tuesday. We hope you can join us again, starting Monday night at 8pm, EST. How did I not know there was pre-made gingerbread cookie dough? I love gingerbread cookies! These cookies look so awesome! You have done such a great job frosting them and that makes such a huge difference – I think I need to practice my frosting a bit more. Yummy and festive! How adorable are those?! I’ve got to make those this year. Maybe a few times! Oh cute! That’s such a clever way to make reindeer! 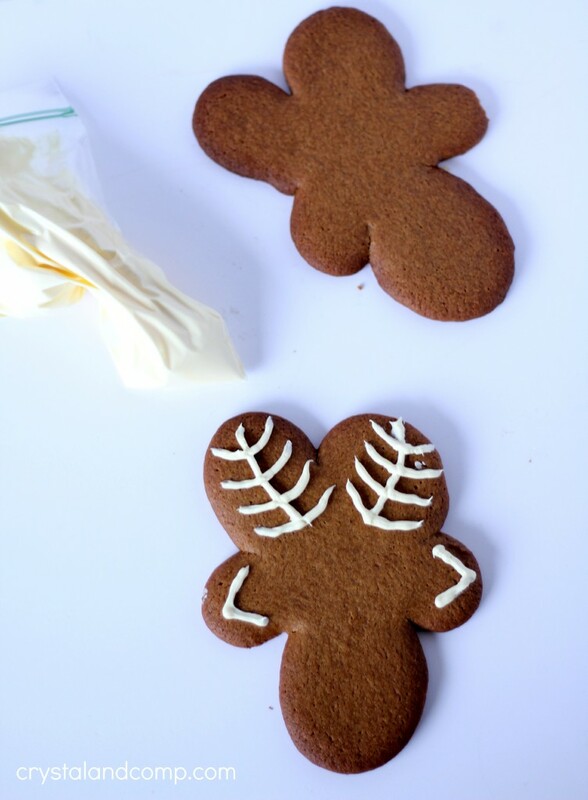 I can’t wait to make some gingerbread cookies this year! Liz Mays recently posted..Simple Winter Nail Care Routine! These are so cute and seem so easy! I love their little gumdrop noses! We’ll be making a batch of these this Christmas! This is such a cute idea! 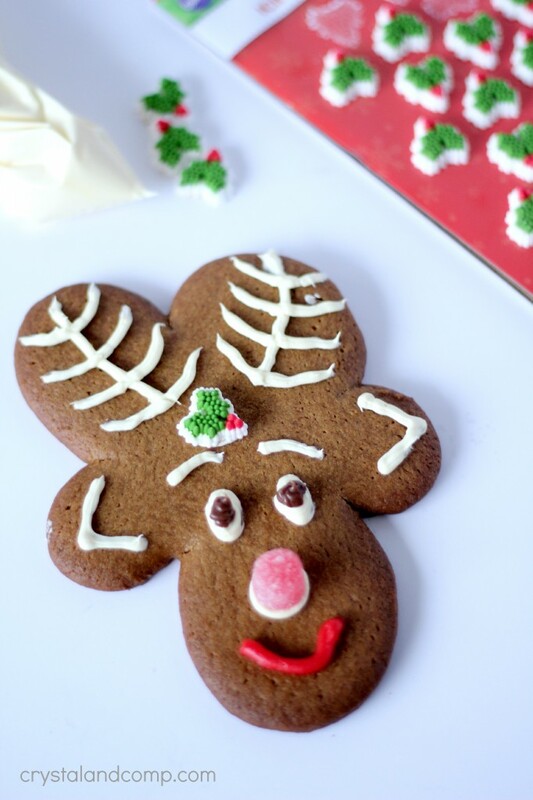 I never thought to turn a gingerbread cookie upside down to make a reindeer! This is a cute reindeer cookie. I gotta admit it took me way too long to figure out what the original cookie cutter shape was supposed to be. My son got it within seconds. This is my kind of cookie decorating. I’ve never been talented in that area, but I think I can handle these reindeer cookies. So, so cute!! What a cute reindeer cookie. I want to surprise the girls and make a batch of this. Oh my gosh these are adorable reindeer cookies! 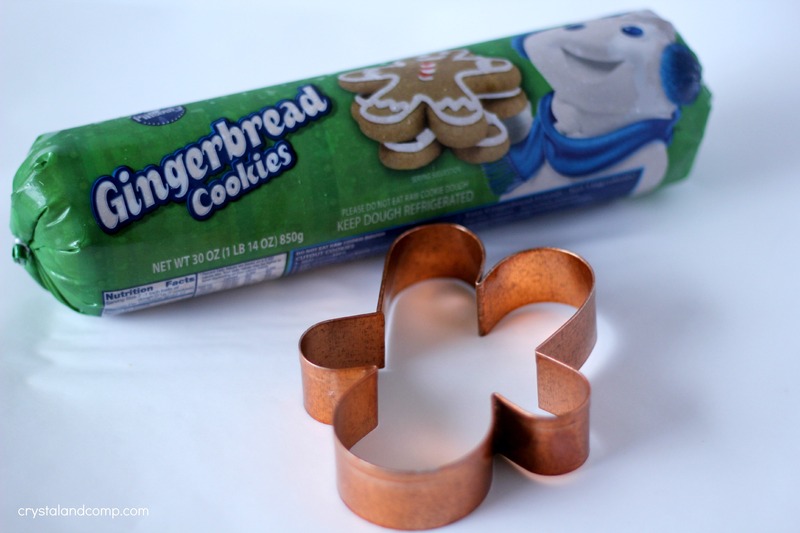 I love how easy they are to make, perfect for cookie exchanges! These reindeer cookies are adorable!!! I wish I could bake!! These cookies are so cute and easy to make. I will have to get the ingredients i need to make these tomorrow. Awe cute. I would have never thought to flip the cookie cutter. Thank you for sharing this idea. Super adorable! These are the perfect cookies for Santa! Plus they look easy to make. 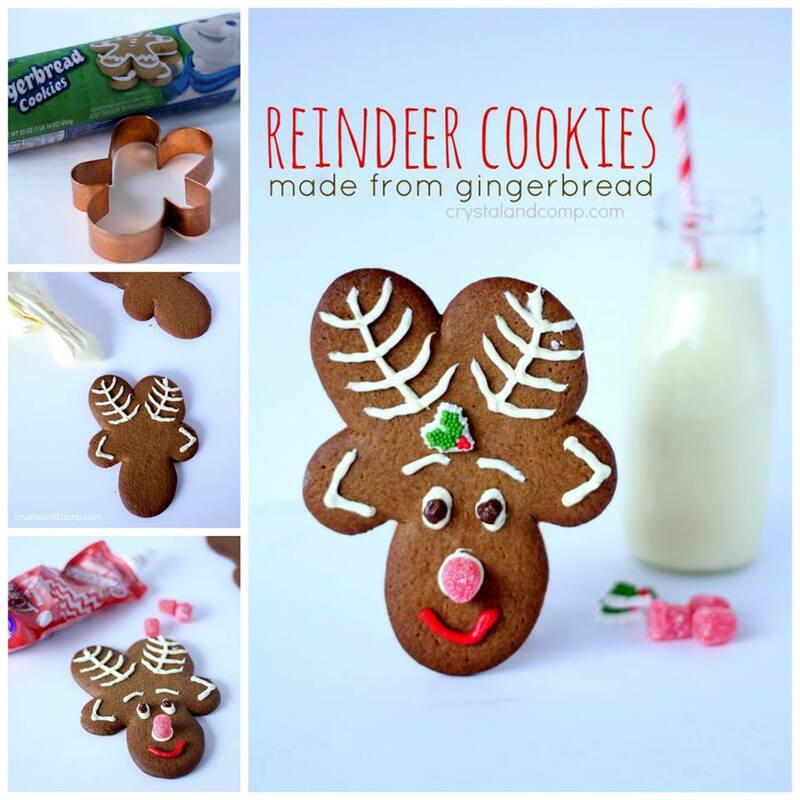 What a cute idea, I’d of never thought to make reindeer cookies with a gingerbread cookie cutter. I’d love to use premade dough this time as the kids get restless waiting for me to mix up our gingerbread dough. Such a cute cookie to make during the Holidays. Your Reindeer cookies look so yummy! My kids would love this! Oh how cute! What a great idea, I’d never think to do this and make them into little reindeer. So cute! I love gingerbread cookies! I had no idea you could buy gingerbread dough like this! I know what I am getting next time I am at the grocery store! These are adorable reindeer cookies. 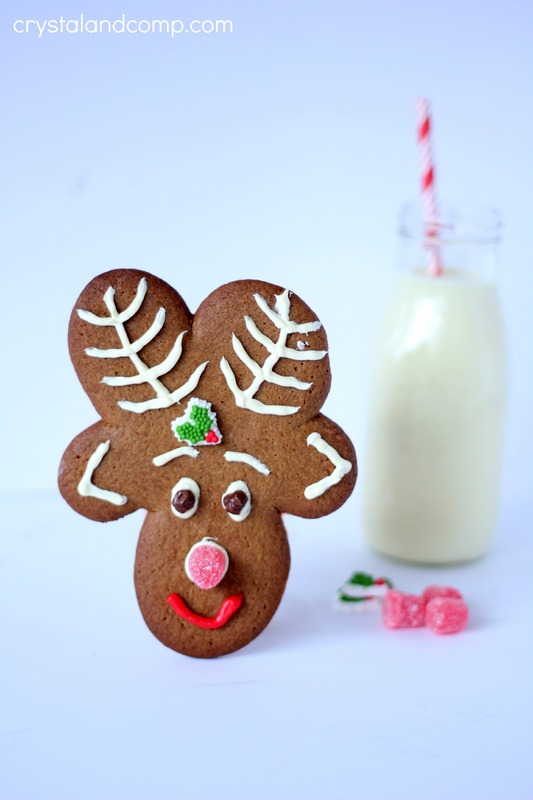 I have not made gingerbread bread cookies ever so these would be great to make with the kids. We love making different cookies this time of year and we have a blast doing it. Thanks for sharing. That is such a cute cookie idea! Our kids would love making these for the holidays! What a really cute idea, I’m terrible at baking cookies. I have no idea why but I promised my daughter we would make some. What a sweet way to celebrate the holidays! I would love to make more cookies this year for our parties. These are adorable! You are so clever! Thanks for sharing. Too cute! Thanks for sharing on the What’s for Dinner link up! Oh my gooooooooosh!! I don’t know why I never thought of doing this before. What a great idea to do with my girls. Thanks for linking up with us at the Share the Wealth Sunday link up!! Your Reindeer Cookies are just adorable! I really appreciate you sharing with us at Full Plate Thursday. Hope you have a great week and come back soon!